Gardening has been called a practice akin to practicing meditation. There are many benefits to meditation. It encourages mindfulness and a healthy lifestyle, improves concentration, reduces stress, and more. When practiced in conjunction with authentic psychic readings, meditation can bring a sense of calm and purpose to your life like never before. Learn about the ways gardening can serve as a type of meditation practice to boost both your physical and spiritual health while enjoying a hobby. Gardening gets you moving and provides a way to physically exercise in a calm, peaceful environment and in the fresh air and sunshine. Digging, planting, weeding, and other repetitive tasks required while gardening are excellent forms of stretching and low-impact exercise. Engaging in even simple regular physical activity like gardening leads to increased energy levels and encourages improved mood and overall healthiness. Gardening is not rigorous and will not do anything for your cardiovascular health. 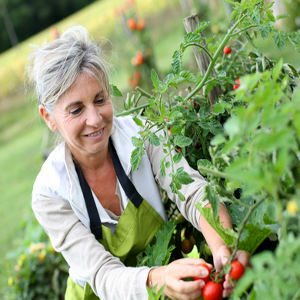 However, because gardening is an enjoyable and goal-oriented activity done outdoors, people are more likely to stick to it over other less engaging types of exercise. Gardening improves concentration and focus while you are doing something productive and creative. Studies show that plants help people concentrate better both at home and in the workplace. People who perform tasks while in the calming presence of nature perform better and with greater accuracy, studies have shown. Taking up gardening is also a way to express your creative side and gain confidence in your ideas and skills, which in turn can boost your mood and contribute to feeling happier. A quick chat with an online psychic can help you get motivated to get out there and grow! Gardening can also lead to eating a healthier diet. Try growing your favorite herbs or fruits and vegetables. Learn about how to keep an herb garden or perfect growing tomato plants. Grow strawberries in season and pick and enjoy fresh berries at breakfast or as a healthy mid-day snack. Incorporate the fruits of your labors into your favorite recipes, or try new healthy recipes. Let gardening become a way to encourage eating healthy as well. Flowers make people feel happy. Keeping flowers in the home or workplace boosts mood and reduces the likelihood of stress-related depression. Flowers increase positive energy and help people to feel relaxed and happy. Grow flowers in your garden and keep them around your home or office, and share them with neighbors and relatives to spread the cheer. Take up gardening as a way to not only relax, but also enhance your life by meeting others through this activity. Join a gardening club and trade seeds and plants to make new friends and build a positive social circle. Gardening regularly can also add structure to your life and provide a way you set aside time to do something both meditative and, if doing it with others, social. Gardening can help you feel more relaxed and keep your body and mind active, happier, and healthier. Gardening also makes a great hobby you can do alone or practice with others.